When you hear the term pedestal table you may picture a round or oval table that is supported by a column or turned post that ends in a base that has feet. The style of the pedestal and feet change from era to era but the basic design of this classic remains the same. Candle-stands were some of the first type of pedestal tables. These small stands often stood next to a bed or chair and held a candle as well as a cup or book. They could be found in many of the finer homes in the Colonial period, the 1600s to 1700s. Pedestal tables in larger sizes first began to be popular in the late 1700s. They were originally designed to fit easily in small dining rooms and still give the elegant look that homeowners craved. Nearly every home had some form of these popular tables. In large homes a pedestal table might be used as a game table in one of the parlors. Many homes had pedestal tables that were small and used for side tables, writing desks, or as display tables for vases and plants. Of course the pedestal table was also used in the dining room as a place to eat. During the Victorian era these versatile tables became more popular, as well as more ornate. The tops could be any shape from round to hexagon, and intricate carvings were added to the pedestal as well as the feet. If you can imagine, quartersawn oak pedestal tables for the dining room were listed for around $25 in the 1900 Sears catalog. Entire dining room sets went for less than $50. There are some beautiful examples of these tables available. This walnut Renaissance styled table is heavily carved, with lions' heads on the feet, finished with casters for ease of movement. This small, Colonial style candle-stand may have held books, candles, and a pipe as well as a cup of tea. This Eastlake style, marble topped pedestal table is heavily carved and squared off, as were many of the furniture from the aesthetic period. 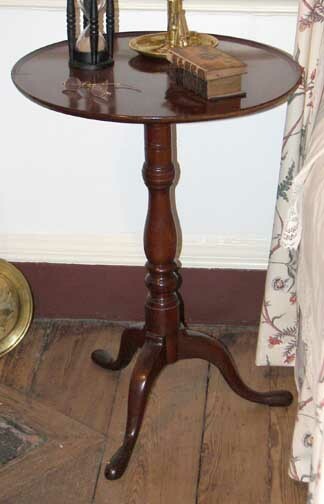 Simple lines were a trademark of classic Empire style as in this pedestal side table. This Chippendale tea table has a tilt top as well as a pie crust edge. The pie crust edge refers to a raised, scalloped rim that follows the curve of the tabletop. A beautiful example of an Art Deco pedestal center table can be found on the 1st Dibs website. 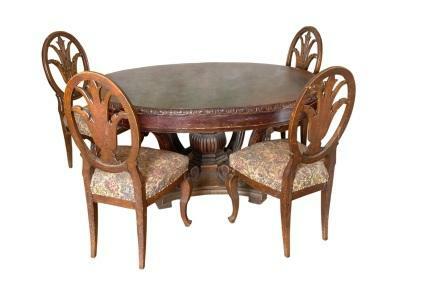 Antique pedestal dining room tables are usually about 42 inches in diameter and have leaves that can be placed in them to make them bigger. These tables are almost a requirement for an authentic Victorian dining room. The tables come in a variety of types of wood including oak and mahogany. Mission style pedestal tables may be difficult to identify because they will often have stretchers in addition to the pedestal. This Mission style pedestal table from 1905 is a good example. These were the forerunners of the Art Deco tables. Pedestal tables continued to be popular through the 20th century and up to the present time. You should look for a table that compliments your décor, whether it is ornate Victorian or simple Colonial or Mission style. Always check the integrity of the attachment of the top to the pedestal. Make sure there isn't a lot of play or movement in this area. It can be difficult to fix if the attachment has become weak. Check that the pedestal itself is in good shape; after all it is what will be holding up the table top and giving it stability. An antique pedestal table is a desirable piece for most antique collectors. Take your time and find one that you love.